With access to both the Mediterranean and the Atlantic, the beaches of Andalusia are as diverse as the rest of this enchanting region. Some provide hidden coves and rocky outcrops, others long stretches of golden sand that remain uninterrupted for miles. Whether you prefer a private getaway or a busy beach with all amenities, Andalusia has that and much more to offer. The Atlantic coast offers long stretches of beach lined with dunes and pine forests. Summer temperatures are here generally lower and more pleasant than on the Mediterranean coasts, attracting Spanish tourists mainly from Huelva City and Seville. The beaches around Tarifa are popular destinations with windsurfers, and the north has many sand dunes and marches as well as popular beach resorts. The Costa del Sol is the most developed part of Andalusia’s coast, and its golden beaches attract large crowds of tourists every year. Most towns along this coast have a paseo maritimo, a beach promenade, lined with restaurants and bars for great after-sun dining.Torremolinos and Fuengirola both boast beaches as long as 7 kilometres, and in Benalmadena you can enjoy 10 kilometres of golden sand. 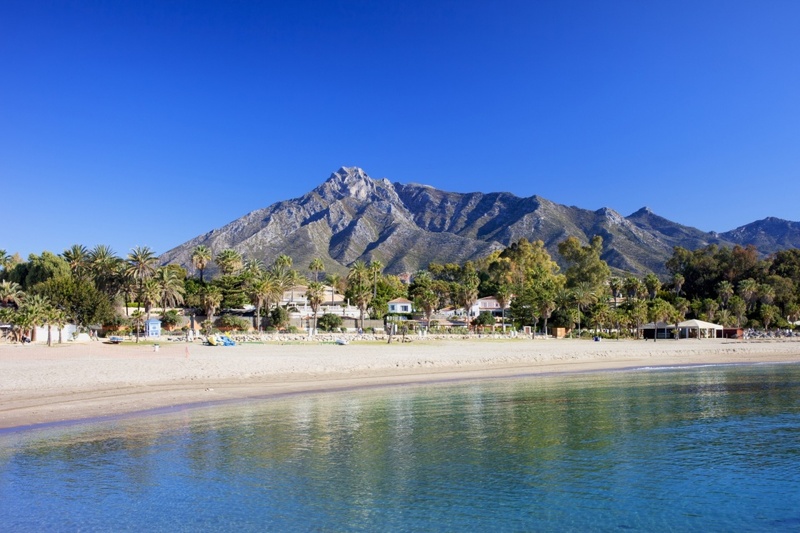 Marbella has several different beaches, such as Playa Puerto Banus and Playa de Guadalmina. Beaches here often have showers, lifeguards, beach beds and access to water sports such as jet ski, pedal boats and water skiing. Don’t forget to have lunch at one of the many chiringuitos, beach bars, that serve excellent food and refreshing drinks right on the sand. Costa Tropical in Granada Province is less known than the others but definitely worth a visit. The Sierra Nevada mountains reaching the sea creates a stunning landscape of rolling hills and dramatic rock formations. La Herradura, near the cosy town of Nerja, is a popular location for divers and sunbathers alike with its golden sand sheltered between tall cliffs. The easternmost part of Andalusia offers long stretches of sand as well as rocky formations jutting out into the sea. Its western part is the most developed, with several large resorts and well-tended beaches. The centre is made up of the Cabo de Gara natural park with beautiful cliffs, hidden coves and traditional fishing hamlets. If you’re looking for solitary beaches, you should head to the eastern part of this coast.